Everyone is looking at how CBD can improve their standard of living but with so many different product types and brands available how do you know where to start? The CBD market can be daunting particularly for a beginner; luckily for you we have created this list to guide you in the right direction. 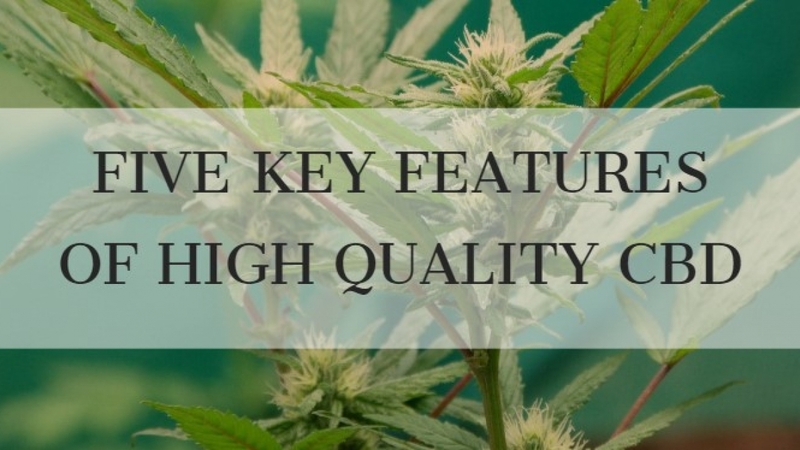 Below we explore the five key features of high quality CBD. In order for CBD to be used in the multitude of products available today such as oils, vape juice, etc. it must first be extracted from industrialised hemp. There are a number of different ways to achieve this; you can use solvents, dry ice and even olive oil. The safest and most efficient method however is by far supercritical co2 extraction. The process is complex, requires expensive equipment and a high degree of expertise but it does ensure CBD is extracted in its purist form, retaining all of its essential oils. Liquid co2 is pressurised and heated until it reaches a precise supercritical state where it possesses both gas and liquid properties akin to a solvent but possessing none of the risk. After that, it is then flushed into a vessel containing the industrialised hemp. This pulls the active chemical compounds out of the plant matter. The CBD and other phytochemicals are then separated from the co2 and refined for purity. This extraction method has been adopted by all the major CBD suppliers and for good reason. You should always look for CBD that has been extracted using supercritical co2 extraction. Another decision you will be faced with when purchasing CBD products is the option of a CBD isolate product or a full plant extract. While CBD isolate has its uses, most science seems to support the theory that full plant extracts are far more effective. This is due to full plant extract containing not only CBD but also trace amounts of other cannabinoids (CBG, THCV, etc. ), flavonoids and terpenes which work together synergistically increasing the benefits exponentially. This is known as the entourage effect or may be labelled on the product as full spectrum. As more and more studies unveil the potential of this inimitable compound we see more and more CBD products available to purchase online. A simple Google search will reveal a plethora of low cost products under the guise of ‘premium quality CBD.’ Unfortunately this swell in popularity and an unregulated market present an opportunity to the unscrupulous among us who are attempting to cash in on the CBD boom by peddling low quality CBD products made using cheap extraction and/or low quality hemp. Many of these products are extracted using solvents, are not controlled and may potentially be unsafe. The fact of the matter is that creating legitimate, pure and safe CBD extract is costly. The aforementioned co2 extraction equipment does not come cheap and requires a high level of expertise however it does ensure the final product is as pure as it gets with all terpenoids, flavonoids and cannabinoids preserved. Bad news for the bargain hunters amongst us, good quality CBD is not a cheap commodity. One of the biggest concerns when purchasing CBD oil is authenticating exactly what is in your product. The last thing you want to do is to inhale synthetic cannabinoids or other toxic ingredients. It is very easy in an unregulated market to make unsubstantiated claims about what a product contains. This is why independent third party laboratory testing is imperative. Look out for a certificate of analysis when purchasing CBD. This will detail the cannabinoid and terpene content of the sample. Some may even test for residuals such as solvents and pesticides. A copy of this certificate for each product should be available on the company website or upon request. This allows the customer full transparency to see precisely what their product contains. Nowadays the average consumer is considerably more astute than in previous years. Much of this is attributed to the Internet and the growth of online reviews. As many as 90% of consumers now claim online reviews influence their buying decisions. CBD is no different. If your CBD supplier is worth its salt, a legitimate customer review will be easy to find online. Although many CBD websites opt not to permit customer reviews on their page due to MHRA restrictions on medical claims, you should be able to find out how others find their products through review websites such as Trustpilot or Google. Be wary of CBD products low presence or no platform for reviews online, there is likely a reason for this. To conclude, the CBD market can be a minefield for a new user. The choices are seemingly endless and unfortunately one flutter with a low quality CBD brand can skew ones opinion on CBD as a product. This is why it is important to look out for these 5 points when choosing a CBD supplement. We recommend always buying your CBD directly from your local specialist and checking the lab reports and online reviews before purchasing. This will help ensure you choose a safe, quality product that is right for you. Hemptations CBD believe in data-driven cannabinoid discussion. We are committed to arming you with as much accurate CBD information as possible to ensure you are making educated decisions when purchasing CBD..